“From a historical perspective, it is clear that since the arrival of the missionaries lay people have actively participated in evangelization, particularly through the work of catechists. Today, lay people’s participation in the Church needs to be reinvented on the basis of new realities. 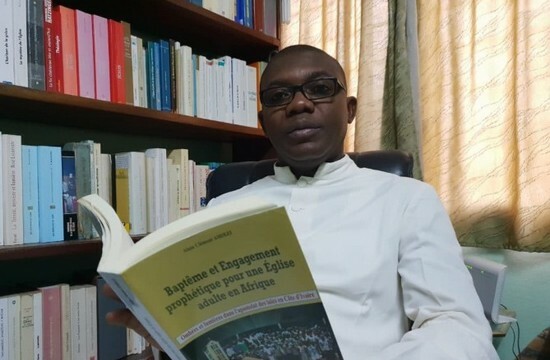 Father Alain Clément Amiézi is a doctor in dogmatic theology and professor at Sacred Heart of Mary Major Seminary at Anyama in Ivory Coast. In his new book, Baptême et engagement prophétique pour une Église adulte en Afrique (Baptism and prophetic commitment for an adult Church in Africa), he focuses on the meaning of baptism and its implications. La Croix Africa: Why did you choose this title? Father Amiézi: The majority of our African churches have already celebrated the centenary of the beginning of their evangelization. Logically, we should now be talking about an adult Church. But at the qualitative level, it is clear that there is still a lot of work to be done. The percentage of those who continue and who complete their Christian initiation by confirmation after the great festivities that accompany the reception of baptism is very low in several African countries today. The number of the faithful who are truly committed in the social and political fields on the basis of Gospel virtues is infinitesimal. We are producing baptized people but not Christians. We provide them with the sacraments without evangelizing them. The responsibilities for this situation are shared. On one hand, in my view, it is linked to the fact that certain catechumens are requesting baptism for the wrong reasons. On the other, it is linked to the quality of the formation received. What impact should baptism have on the life of African Christians? Prophetic commitment involves three aspects. First, there is Christian coherence which invites us to break with the dichotomy that often exists between the life of faith and everyday life at work, school and in the family. Christian life is not an overcoat that one can leave at the parish door and collect again when leaving. The second aspect is courageous witness. Our African countries need Christians capable of breaking with the notion that “everyone acts like that” and who are capable of living out their faith through their Christian commitment at social, economic and political level. The third aspect is to develop a spirituality that assumes and allows Christians to courageously face up to existential problems. This is because there are forms of spirituality that actually paralyze our Christians and turn them into children to the point that their vital forces are annihilated. Who is responsible for this prophetic commitment for an adult Church? Priests or lay people? Everyone — priests and lay people — needs to work for the good of the Church. Priests need to play their role as formators, mentors and guides. They also need to fully work with lay people to promote a shared sense of responsibility in the Church. The time when the priest did everything and the lay person was simply a passive observer ended with Vatican II. From a historical perspective, it is clear that since the arrival of the missionaries lay people have actively participated in evangelization, particularly through the work of catechists. For this reason, I began the book by taking a look at the phenomenon of new communities and fraternities. I wanted to recognize their contribution but also to raise the issues that may arise from this. Because it can happen that they plunge Christians into obscurity and turn them into children. It is imperative for pastors to verify the criteria of ecclesiality for these prayer groups in the light of the 2016 letter from the Congregation for the Doctrine of the Faith, Iuvenescit Ecclesia.